Quartzite (from German Quarzit) is a hard, non-foliated metamorphic rock which was originally pure quartz sandstone. Sandstone is changed into quartzite by heat and pressure related to tectonic compression. Pure quartzite is gray or white, however as it was form varying amounts of other mineral causes quartzite to have numerous different colors. When sandstone changes into quartzite, the individual quartz grains recrystallizes along with the former cementing material to form an interlocking mosaic of quartz crystals. Most or all of the original texture and sedimentary structures of the sandstone are erased by the metamorphism. The typical sandpaper like surface of sandstone becomes glassy in appearance. 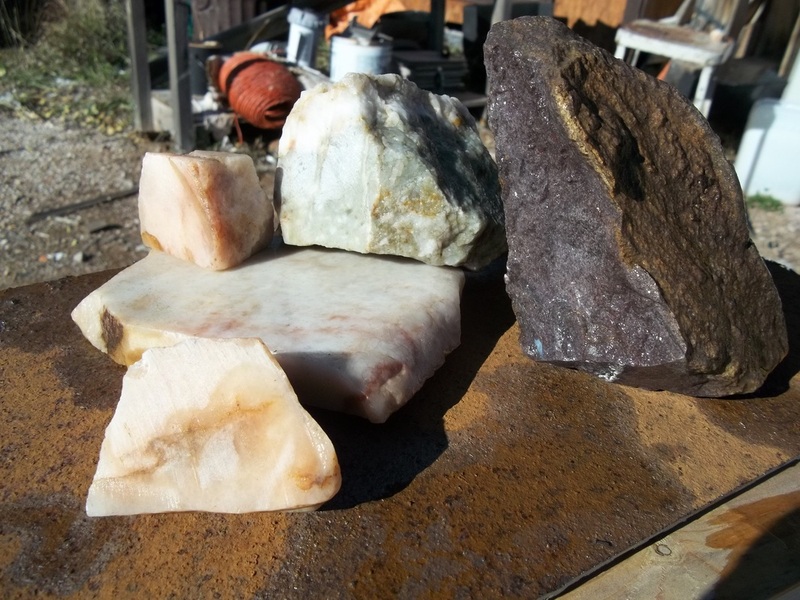 The smaller light orange specimen on the top left is what I call peach quartzite. This specimen was found on Crystal Mountain. I like cabochons made from this material, reminds me of a peach slice. The chunk it is setting on is a cream colored quartzite, the chunk in front has light yellow color which is quite attractive. A greenish quartzite from Quartz Ridge south of Bennett Creek is interesting in that some of the cabochons reminds me of pictures of the hills in Ireland that I've seen, green rolling hills with a cloudy sky.